Tipong Coal Mine is located in Northeast India, on the border with Burma, and for the moment runs the oldest steam locomotive in regular service in the world, and a Darjeeling B class.Living on borrowed time, this 2 foot gauge railway takes coal from the mine through the jungle to a truck loading facility. Far from tourist destinations, this seldom visited little line is full of charm and character! As soon as they have the money, two bridges will be rebuilt, the coal will move by truck and this delightful little railway will die. 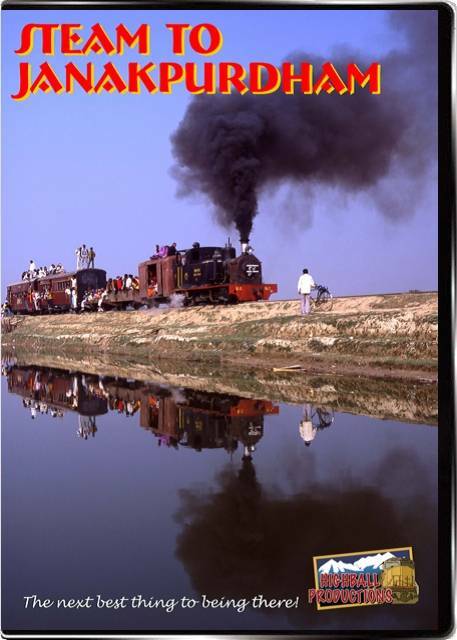 The Janakpur Railway runs from Jaynagar, India to Janakpurdham, Nepal. This 2' 6" gauge line has now dieselized, but we rode and taped a chartered steam train, with an 0-6-2 Hunswell Clarke side tank, built in 1930. We were only allowed to stay in Nepal for one night because of terrorists! The festival of Rama Sita was going on in Janakpurdham during our visit, and there were thousands of people on the station waiting for the diesel train, many of them rode on the roof and sides, and on flat cars on our chartered train. Runby's, the ride from the train (and the roof) and a look at the people. An entertaining look at a charming little railway!